This is the NSF Certified version of aspectLED's 2.25" LED Recessed Light. 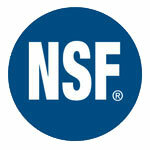 NSF Certification is typically required for commercial food preparation environments. If you're looking for the standard, non NSF Certified version for all other applications, click here.